This holiday season the big ticket item on many lists will be a virtual reality headset. Just last quarter over 1 million VR headsets were sold with Sony selling more than 490,000 and Oculus and Rift following close behind. The increase in popularity has a bit to do with price. Oculus recently lowered the cost of their headset to $199 to boost sales. That strategy appears to be working well, with the sale of the headsets making huge leaps and bounds every month. 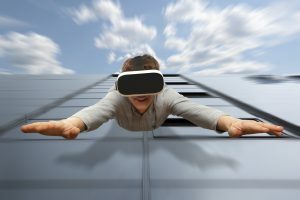 The expectation is that more VR headset vendors will enter the market in 2018 and the trend will continue to even greater sales figures. The hope is that the technology will breach the gaming market into the business sector where there are numerous applications for the medical, manufacturing and education industries. Along with new headsets, VR content is continually evolving to keep pace with the hardware, and there is an urgent need for better and more original content to keep up.